All is not fine and dandy for Blizzard's presumed sci-fi blockbuster in Korea. StarCraft II, the sequel to the Korean national phenomenon, has recently been slapped with an Adults-Only rating by the Korean Games Rating Board. The rating, which is less than ideal for developer Blizzard, brands StarCraft II as a game only for those 18-and-older, and was possibly influenced by StarCraft's massive popularity in the country. Blizzard has 30 days to appeal the rating, but hasn't decided if it will try to do so yet. "We have nothing to say at this point. We are discussing our official position on the matter as well as what would be the right reaction," a Blizzard Korea spokeswoman said. If Blizzard tries to adjust StarCraft II's content to try for a Games Rating Board re-review, it's projected to push the game's Korean release back around a year. 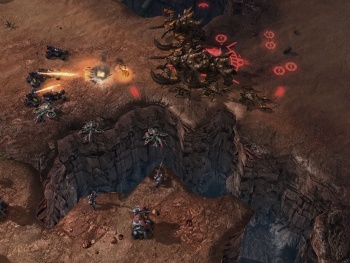 Previous test versions had been rated 15-and-older, but Blizzard submitted the game's release candidate to try for a 12-and-older rating, which is the rating the original StarCraft carries. The move appears to have had the opposite of the desired effect. "Considering that the RC version of the game is closer to what will be sold on the shelves compared to the beta versions, we looked more carefully at the content," a Games Rating Board official reasoned. Violence, drug use, and language may have been the deciding factors in the game's AO rating, but the Korean government is also trying to reduce the potency of addictive activities for children. With StarCraft basically a national sport in Korea, it falls directly under the government's perception as such an activity. Whether there was actual content in StarCraft II that the Games Rating Board found wasn't appropriate for those under 18, or if another factor was at work here, remains to be seen.